I grabbed some screenshots during the tour he gave them. Take a look! George Clooney’s House in L.A. He bought this one when he was starring on “ER” and needed more privacy from the photogs who were hounding him. He says they always rented houses when he was growing up, so owning one of his own was important to him when he got out on his own. Update: Sorry, but CBS took the video down. Click Here to See Inside More Celebrity Houses! George’s house is chic and masculine. Perfect for him! He’s so cute!!! I love his kitchen too. It appears so lived in and masculine. Really?? A star of this magnitude…with a house…almost humble?? Would love to see his Italian villa (castle, really) with its own landing for his ship! omgosh! I love love George Clooney, he IS my favorite actor. I think I love him even more now. His home is lovely, but very humble for an actor of his caliber. George could live in anywhere. You would expect him to live in a pretentious home in Malibu, but he lives in a modest (by Hollywood standards) home in Studio City that he has owned for 20 years. Love it. It is a beautiful kitchen but I find it interesting that the microwave is just sitting on a counter top and not a built in. 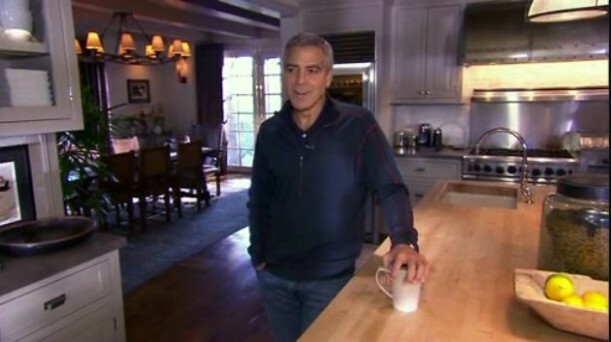 You had me at “George Clooney!” 😉 Love the countertops in his kitchen, and the chandelier in the other room is fabulous. Hello, George… remember me? (never met him but wouldn’t you love to be able to say that to him? LOL) Thanks for sharing, Julia! Have a wonderful Wednesday. Thanks for posting this – I never would have seen it otherwise. Now beware of your server crashing because so many folks will come searching for it today! I loved watching this clip on the CBS Morning Show. I understand he has a grand home somewhere else as well..does anyone know where? I have to say I’m impressed with George Clooney even more after this interview. His home is gorgeous and the outside loggia is stunning. But that he’s had this home for so long and not ‘kept up with the Kardashians’ allows me to keep respecting the man. I love George’s kitchen! But, then who wouldn’t love any kitchen with George in it! i didn’t think it was possible to love him more. but, yeah. As if I needed one more reason to swoon over George Clooney, I love that quote from him. And I love that he’s lived in the same place for so long. Great kitchen, but I am LAUGHING OUT LOUD! Did he really pick a crumb off the kitchen counter and flick it onto the floor??? He’s such a MAN! ha! I saw that too! LOL. When we get married, I shall put a stop to that type of behavior!! Real live books in the beautiful den off of the beautiful kitchen?? See, we’re perfect for each other! That was a treat. 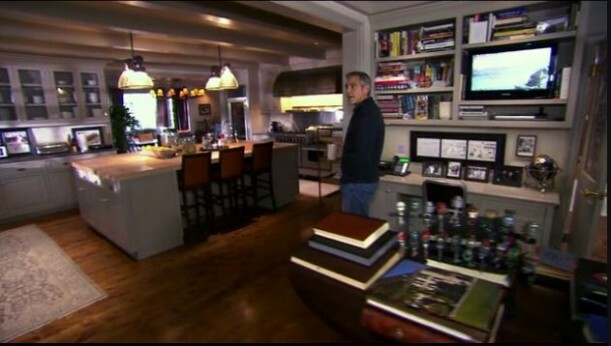 It was great to see the video of his home and listen to the chat with George Clooney. His home mirrors his personality – relaxed and casual, I think. Thanks. I really enjoyed the Person to Person show. 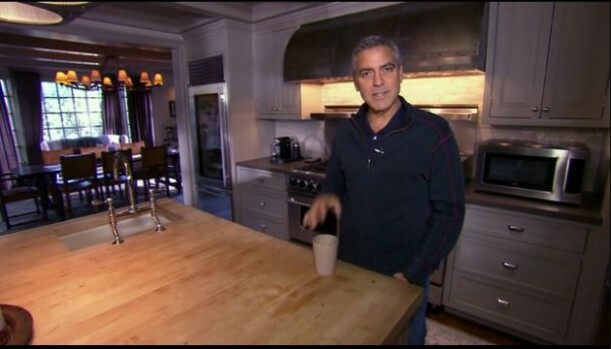 George Clooney just keeps getting better with age:) I drooled over his kitchen, even if he only uses it for take-out food. That show was really great to watch. You grew up in Cincinnati, right? Did you love all of his Cincinnati stuff? My dad likes to joke around and call George Clooney “Nick’s son”. All that prating about the definition of a home, but then he and that sterile kitchen don’t seem to have much to offer those vaunted friends and relatives by way of a collation. How did I know his house would be as classy as he is? I’m with you, Julia. Love that kitchen! Oh I am so glad you posted this! I didn’t want to miss it … apparently I did. I LOVE his kitchen too! And all that entertaining space outside? WOW! I want to come over. Lovely home. Both George and the casual warmth of the place, well – swoon. I caught part of that show and though not mentioned in this clip they shared he bought the house from Stevie Nicks. love him…this just goes along with what i already thought. Cool! I have never seen the interior of George Clooney’s home. It fits him well. I have a friend who grew up with him and her brother was a good friend of his. I had to giggle at Design…. it is all in the Detail because not too many years ago she did run into George and I believe she did say, “George, do you remember me?” I know when she first said she had gone to high school with him I didn’t believe her because she is teases and knows I am gullible – but I have come to know it is the truth! So cool…..
What’s not to love!!! Such a great space and I love that it’s actually a look that would be possible for those of us that aren’t gazillionaires. George Clooney is such a good actor and it’s so much fun being able to see his house. What a gorgeous place he has. I love how every room feels so humble and right at home. I could definitely see myself living in a place like this. What a great space…boy you can just imagine what a catch he’d be if only he would ever decide to marry. I love your blog and I love to look at houses, but in this case, “house-schmouse”! All I could look at was George!! Is it just me, or does everyone just want to go hang out with George Clooney? This was awesome. Thank you so much for posting. I loved Rosemary Clooney’s framed 45. That George, he just gets better looking by the second doesn’t he? Happy sigh. His house is nice too. Yum. If I was blind, I’d still fall for his charm. Love that his house is not pretentious, but looks comfortable as well as appealing. It’s great that he has all these mementos of things that hold meaning and memories for him, not just art chosen by a decorator. He’s so comfortable with himself and who he is and his house reflects that. Gorgeous home. Warm and lived in. I wonder if Michael S Smith was his designer. He designed an apartment for Randy Gerber and Cindy Crawford. He also was the Obamas designer in the White House. Off to Google! If you find out, let us know! He said on the interview (I watched it) that Randy Gerber was his friend and helped him in designing it. How fabulous. Is there any chance there are pictures of the bedrooms or baths? I would love to see them. The one thing that I saw that makes his a home and not just a house was the box of tissue sitting on a sideboard as he strolled by. Just that tiny. Oh I am in love and George aint that bad either!! Love the house and I love George… who doesn’t? 😉 I love that kitchen!! I wonder how many women imagined sharing that home with him.